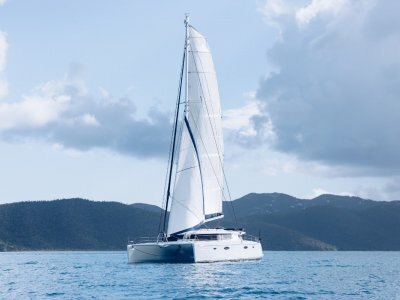 CRUISING WORLD 2018 BEST CRUISING CATAMARAN 2018 AWARD ! 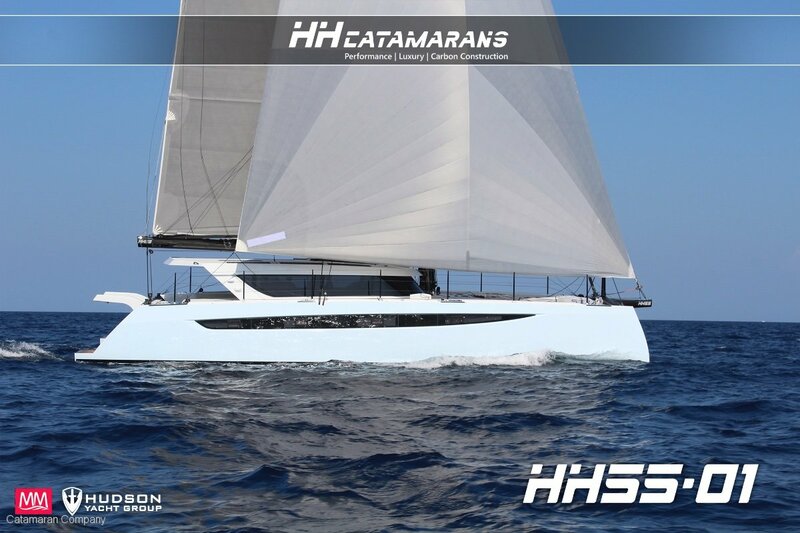 An exquisite amalgam of style, speed and manageability, the HH55 is a fast, ocean-ready yacht prepared to sail anywhere in the world. 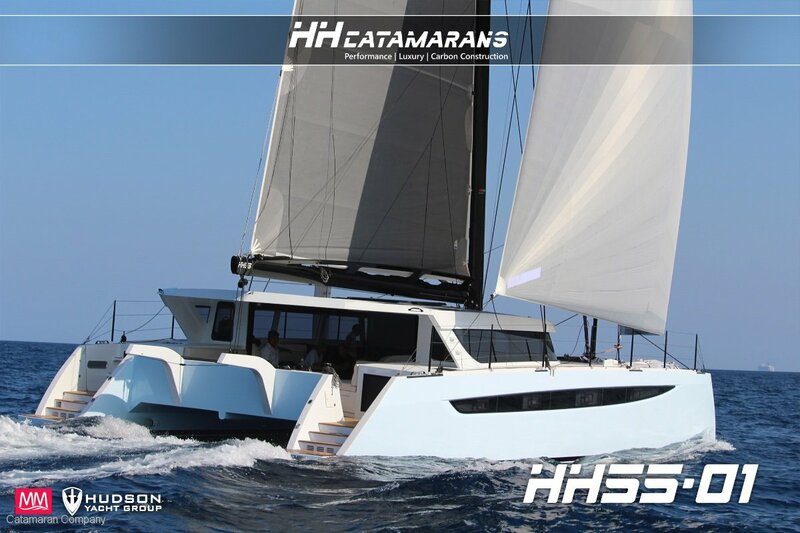 Designed and engineered by the highly successful design team of Morelli & Melvin, the HH55 is a boat that is safe and easily handled by just two people for short-handed sailing. 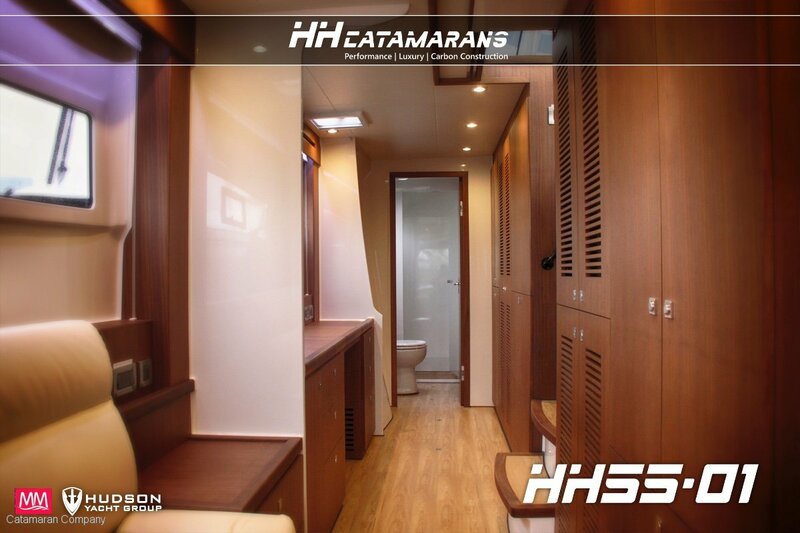 There is also a lot of room for customisation and personlisation with both 3 or 4 cabin layouts and additional interior styling options. 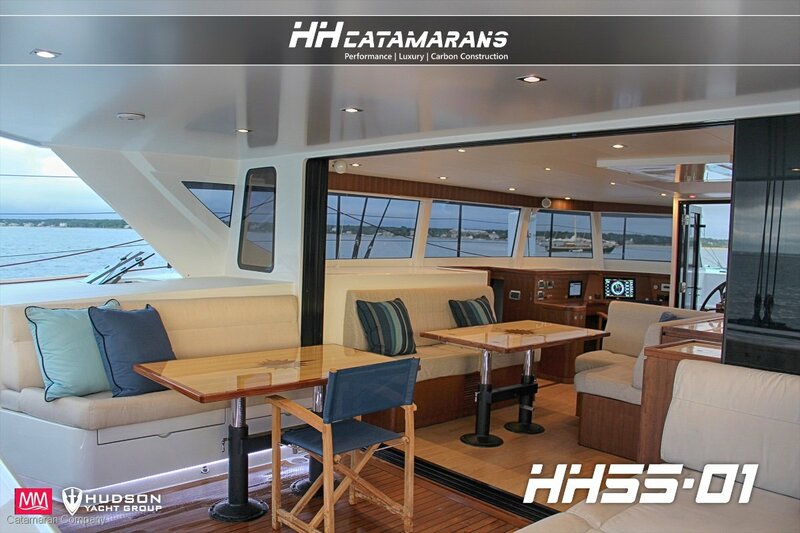 The spacious saloon flows into a large aft cockpit which features the safety of full visibility from the aft help stations, or alternatively, the central command of the forward helm station. 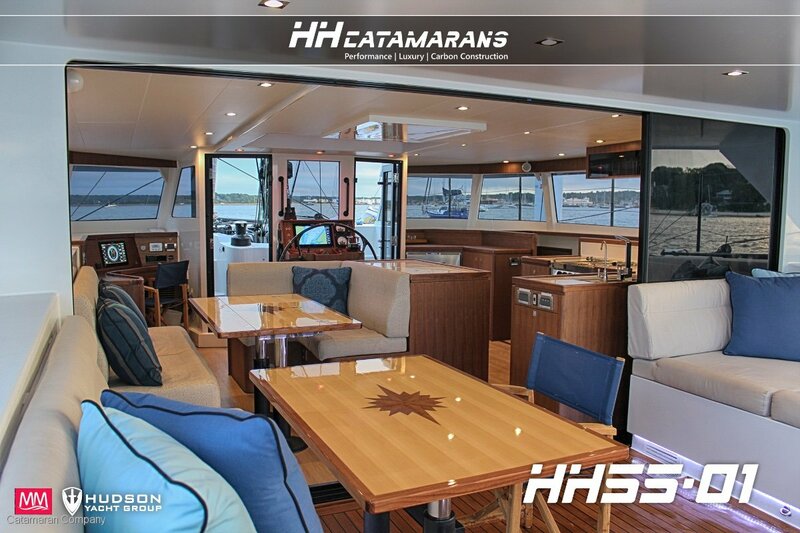 In keeping with our commitment to a high level of luxury and performance, the HH55 is an all carbon affair. 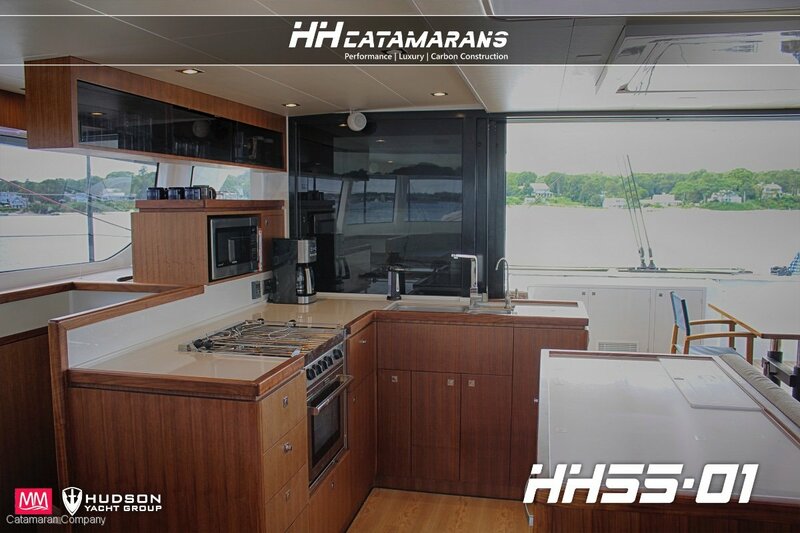 Rig, Hulls and structures all enjoy the superior safety and weight saving properties that only carbon can offer. 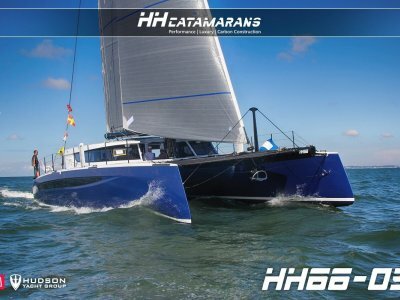 Like her sister ship, the HH66, the HH55 has a curver "C" daggerboard and T-foil rudders, giving greater performance and a smoother ride in the waves. 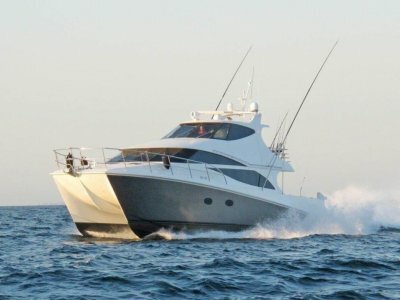 This is a very fast boat that is truly ocean ready to take you anywhere your heart desires as her very happy owners will testify!! * Two carbon dinghy davits, seamlessly attached controlled from reacher winches with jammers to support an agreed suitable model tender and motor. Davits to be designed to reach aft tube of RIB, to hoist RIB to a Designer agreed level and height. Rigging is internal and serviceable. Adjustable simple paddle board attachment points on top of davits probably consisting of 4 foldable padeyes. * C-Zone house electric digital switching and monitoring system with 10" control screen in Nav station. * Shore power 220V60Hz. Single 50 amp socket in aft stbd transom. * Base Navigation System - helm stations 1x16", nav. Station1x 16"
** Details of the packages are part of the options and pricing sheet. Your name will be forwarded to these respective companies who will be in contact with you to discuss. 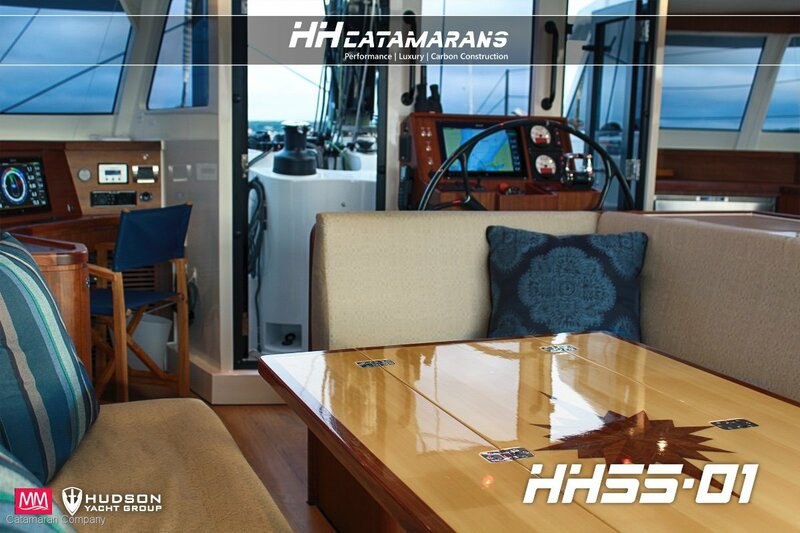 You will have the option to buy direct or through HH Catamarans. 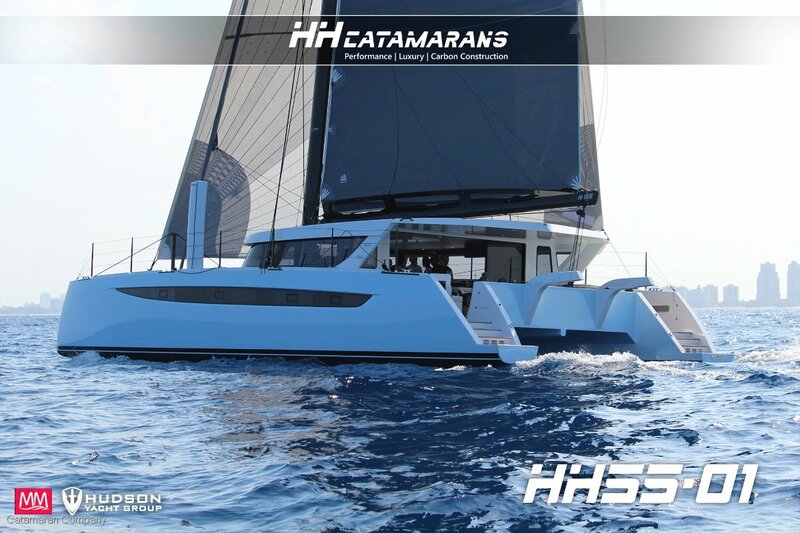 * 23.3m Standard Modulus carbon fibre fractional non-rotating mast, diamonds, lower stays and cap shrouds, single carbon spreaders finished with colour coat paint, 2-part paint system. Raised forestay position, raised staysail position from standard positions. * Solent with single line furler. * Self tacking Staysail with single line furler. * Reacher with continuous line furler. * Separate Cunningham for 1st and 3rd reefs. * Symmetric curved (Cs) daggerboards, 5.25m long, build from precision female carbon moulds, hollow construction with internal carbon sheer webs(3), all carbon pregreg is NC computer cut and 'kitted' for lamination accuracy, strength performance, and carbon layer count control. Each board is load tested to maximum working load of 13,000kg, deflection is measured to ensure design conformity. Top of the board has a 'safety fence' with dense silicon rubber collision bumpers to avoid losing the board from free falling through the case if the 'Up' control line breaks. Top of the board has a mounted folding padeye for halyard hoist, and a water proof air vent for air expansion from sunlight. Boards are finished with a hard polished resin or PU paint, large contrasting painted depth indicator numbers on the upper aft face, and antifoul paint on the permanently immersed tip. Composite structural engineering and laminate specification as determined by M&M. * High aspect spade rudders, carbon stocks built from carbon prepreg, and carbon blade construction. Rudders are housed in self aligning * JEFA bearings with water tight tube. Each rudder shaft is load tested to maximum working load and deflection is measured for design conformity. 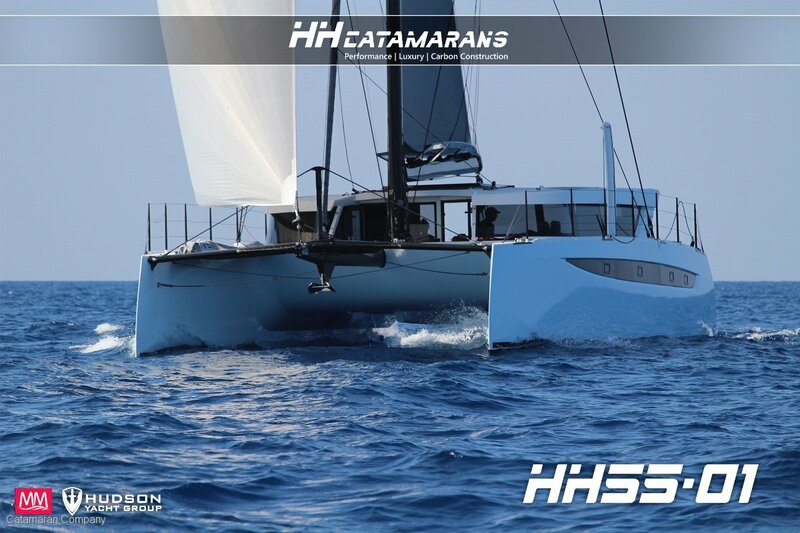 HH Catamarans is dedicated to building in the highest quality, most technologically advanced, luxury cruising catamarans in the world. 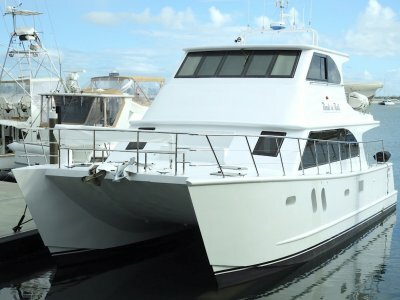 Our boats are designed to be customizable to such extend that every boat we build is unique to the owner and perfectly suited to meet their requirements. 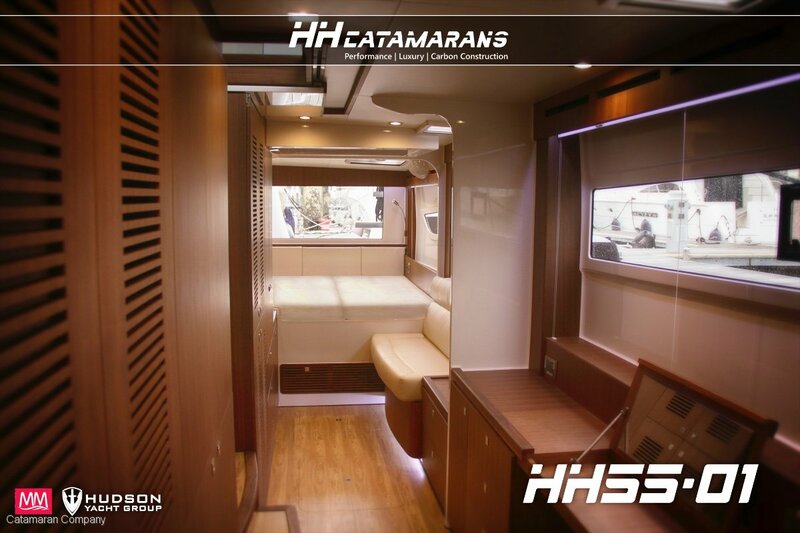 Everything from interior layout and design to helm position can be tailored accordingly to what matches the owner's needs, and always with the highest level of quality maintained throughout. Our finishing departments are lead by the most experienced and skilled painters, carpenters and riggers found anywhere. Many are expats from the marine centres of excellence in New Zealand, UK and South Africa. DISCLAIMER: The company offers the deatils of this vessel in good faith but can not guarantee or warrant the accurance of this information nor warrant the condition of the vessel. A buyer should instruct his surveyor to investigate such details as the buyer desires. This vessel is offered subject prior to sale, price change, or withdrawal without notice.